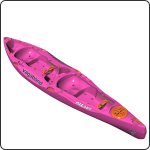 Children will love paddling the Mazowe with you or with a friend. The Mazowe has so much space that more than two children can climb onboard, using the two Tankwells as additional seating for smaller passengers. Dogs can be seated in the bigger Tankwell behind the rear paddler or in the centre Tankwell in front of the rear paddler. Line the tankwell with a foam mat to prevent their paws sliding so that they can sit upright to enjoy the scenery. With the power of two paddlers and a hull shaped for speed, the Mazowe can really move on flatwater. Use the 8″ Screw Hatch and the two tankwells for gear. The Mazowe is great for overnight trips. The Mazowe has the comfort and enough speed for long trips, but it doesn’t really have the packing space required for two people. For this reason, it is not a great touring kayak. While the Mazowe is suitable for fishing, if angling is your sport, we recommend our angling options, which come with two flush-mounted Rod Holders, Deck Rails and an Anchor Trolley. Take a look at the Kasai Angler, Tsomo Angler and Tarka Angler. 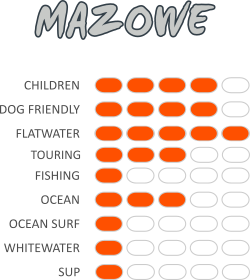 The Mazowe will reward you with great experiences on the sea – shared with a paddling partner. Use Thigh Straps attached to the Clip Rings to keep you on the deck should a wave catch you by surprise. Thigh straps also allow for greater control. The Mazowe can punch through waves to get you behind the breakers and then back to shore, but it has not been designed to ride tubes. For real wave surfing, get our Dumbi kayak instead. While river tripping is a pleasure on the Mazowe, keep to sections of river with smaller rapids. Use Thigh Straps attached to the Clip Rings for better control. We don’t recommend paddling the Mazowe from a standing position but we do recommend standing up on the Stand-Up Platform to stretch your legs while you’re out on the water.